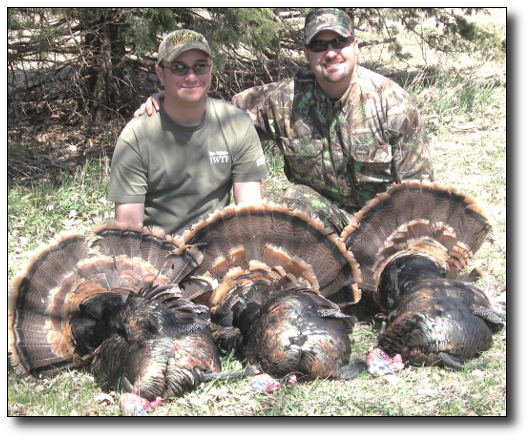 The Kansas 2009 shotgun season opener will be one I will always remember. In my opinion, Kansas has some of the best turkey hunting in the country. My buddy (James) and I had roosted the birds the night before. We saw and heard a lot of birds on the property we had reserved. This particular morning the temperature was a cool 25 degrees with little to no wind and the skies were clear. We arrived at the property almost an hour before daylight. We walked in with the light of the moon and positioned our 3 decoys across the field approximately 150-200 yards from the roosted turkeys. We heard our first gobble at 6:05am. For the next hour there was never a single minute in which we did not here a gobble. I played in my mind over and over how it was going to happen. The birds would all fly down in the field and come running to our decoys to investigate what newcomers was trying to invade there house. Our only problem will be deciding which one to shoot or how to get a clear shot. As we all know, it usually never happens that way and this morning would be no exception. As it began to get light we began making out the silhouettes of turkeys roosted in the trees across the field. Birds began landing in the field 100 yards away. Gobblers, hens, and jakes were all grouped. Our first encounter was with 5 jakes that came across the field to check out our decoys. I remember seeing the fog coming from their breath when they would gobble. The big birds were still hanging out at around 80 yards almost as if they were just watching how the jakes would respond around our decoys. Finally, all the birds were on the ground and in the field in front of us. There were at least 75 birds. Most of the adult gobblers were chasing and fighting each other. After watching this awesome display the birds began to retreat to the creek they had come from. We could not believe that we had let all of the birds leave without firing a shot. Our second setup was across the field where the birds entered the creek. 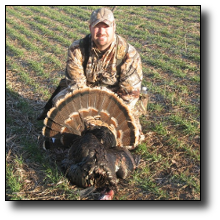 One good thing about hunting a group of turkeys that large is that one can usually determine their location fairly easily. They were beginning to split up and go in several different directions. It did not take us long to tell that the birds were on a track heading south down the creek. We also moved south down the creek 200 yards beyond where we believed the birds to be. We then began walking back to the north once we got in the creek bottom. We moved very slowly and let our ears tell us when to setup. We heard a hen approximately 100 yards ahead. The third setup was a beautiful area. This creek bottom was full of lush green grass and open timber. My first yelps brought out a gobble. The sound came from a 10 o'clock position from our location. I rested my gun on my knee and prepared for the shot. 5 Minutes later I caught movement at the 2 o'clock position and there he was in full strut! He looked as big as a barrel. I settled my crosshairs on his neck and cut with my diaphragm call to bring his head up high. He dropped as soon as my Winchester SX2 fired. It was 10:30am and I just bagged a great Kansas tom. He had a 10" beard with 1-3/8" spurs. The hunt was not over. Birds were still gobbling and my buddy had still not pulled the trigger. We decided to head to the north end of the property. On our way through the creek we ran across several deer and saw where the birds had roosted that morning. As we reached the north end of the property we kept hearing a hen to the east about 200 yards. Our final setup was in a small field with cedar trees on one side of the field and hardwoods on the other. The field was 150 yards long and 50 yards wide. As I began calling to the hen we heard a gobble 250 yards to the north. As the gobblers got closer it was apparent there was more than 1 bird gobbling. Finally, the birds entered the field 100 yards to the north. There were 3 toms. They began to slowly work their way in our direction. When I say slowly I mean it took an hour to come 70 yards. At 12:30 James killed 2 toms. One had a 10" beard with 1" spurs and the other had a 9" beard with 7/8" spurs. This is my first year to hunt with HSP and so far it's been nothing but great experiences from the places to hunt to the personnel at HSP.